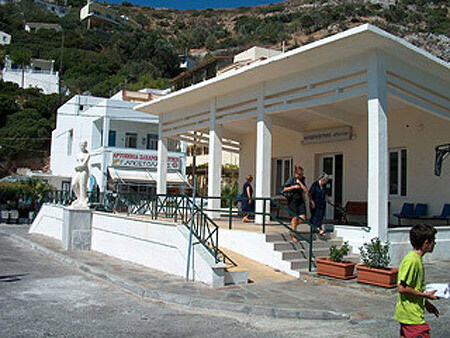 The Apollon Spa is located in Therma town center and is operated by the municipality of Ikaria. The theraputic spring source of Apollon is radio-energic and is known to heal and relieve a variety of ailments and disorders. Treatment rooms with bath water from mixed source springs (Apollon Spring and/or Cave Spring). Regular cleaning and disinfecting of facilities and equipment. The spa maintains some form of insurance, but it is each bather's responsibility to be fully insured for medical/accident/travel. Medical permission is typically required but can usually be issued locally by staff or doctors. Bathers need to bring with them the following items: shower cap, non-slip slippers, towels or bathrobe. Before using the facilities you are required to take a shower. Use of the facilities should be on an empty stomach or at least 3 hours after your latest meal. Personal care products such as cosmetics, creams and other oils are prohibited while using the facilities because they can alter the properties of the thermal water. There is no private parking at the spa. 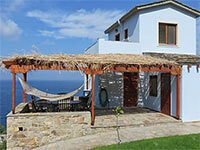 Apollon Spa is located in front of the beach in the center of the town square of Therma. 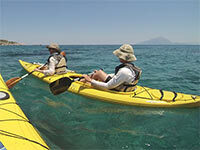 In the summer time a local bus from Agios Kirykos serves Therma at regular intervals throughout the day in addition to a water-taxi. You can walk to Therma from Agios Kirikos in about 15 minutes if you take coastal path/road that starts from the police station. 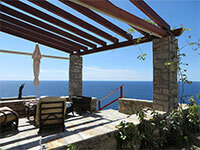 By car, Therma is a 5 minute drive from Agios Kirikos. A taxi will cost around 7 euros. No appointment neccessary. Be sure to check locally for latest hours. composition of a solution weighing 1 Kg.